Kenny Anderson was a great talent, a player that the NBA expected a lot and on the other hand an underrated player that most of the people used to forget when they were talking about the best point guards of the game at 90s. He was a basketball prodigy and a basketball legend of the New York city from his high school years. This is a huge accomplishment for a basketball player. But his NBA career was not exactly what it was expected from him. He has been drafted by the New Jersey Nets at number 2 of the 1991 NBA draft and played for them until 19 January 1996 when he was traded to the Charlotte Hornets. At the summer of 1996 he signed, as a free agent with the Portland Trail Blazers where he played until 1998. 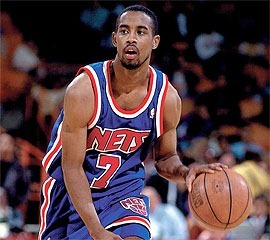 The last team that Kenny Anderson played during the 90s was the Boston Celtics. Anderson was a natural point guard, he could lead his team, but he never became a superstar and I believe in some point it was a matter of character and not of talent maybe even the fact that he never played for a contender. I believe though that it was mostly his suicidal attitude. He had the talents, more than most of the point guards of his era, but that was not enough. He had a lot of fun during his NBA career and he end up broke. It is really encouraging to read that he found his way to get over it and move on. His NBA career highlights can be summarized in an all star appearance (1994) and a second place in assists per game during the 1994-95 season. In his best season (1993-94) he averaged 18,8 ppg. 9,6 ast. and 1,9 stl. as a player of the New Jersey Nets.